We’re always happy to welcome back Marilyn Meredith, author of over thirty-five published novels, including the award winning Deputy Tempe Crabtree mystery series. 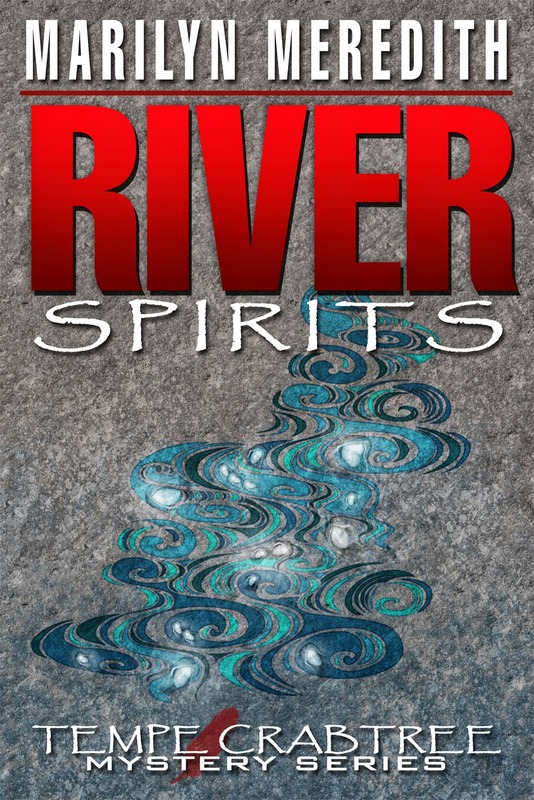 Marilyn is on a blog tour to promote her latest release, River Spirits, and she’s offering a prize. The winner will be the person who comments on the most blog posts during the tour. He or she can either have a character in her next book named after them, or choose an earlier book in the Deputy Tempe Crabtree series—either a paperback or e-book. Tomorrow she’s hopping over to Rabbi Ilene Schneider’s blog. Learn more about Marilyn and her books at her website and blog. The third book, Deadly Trail was not the first in the series to be published. Deadly Omen (a murder at a Pow Wow), Unequally Yoked (a missing child), Wing Beat (hidden marijuana farm), Intervention (a snow storm and murder in a mountain lodge). Then another small press published Deadly Trail (the introduction of Nick Two John and the murder of the owner of the Bear Creek Inn) as a prequel. Sadly, the first publisher died. The next small press publisher quit the business. I met a publisher at an e-book convention, pitched my Tempe series, and now all the books have been published or republished by Mundania Press. Dispel the Mist (While investigating a murder of a prominent woman with ties to the Bear Creek Indian Reservation Tempe has an encounter with the legendary Hairy Man. And the latest, River Spirits, is described below. I’ve written each book so it can stand-alone, though the characters do change from one book to the next. When you read one, though, you can be sure that the mystery will be solved by the end, and the “bad guy” will be caught. Oh, hear the bells ring, "Ting-a-ling-ling!" Tomorrow is Thanksgiving here in the United States. Most people know that the first Thanksgiving was celebrated by the Pilgrims in Plymouth, Massachusetts in 1621. Governor William Bradford, the Pilgrim leader, hosted the feast and invited the Wampanoag Indians, but did you know the celebration lasted for three days? Also, the Pilgrims and their guests ate with spoons, knives, and their fingers—no forks. 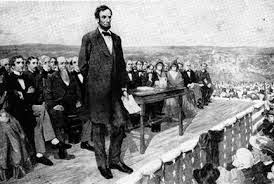 Abraham Lincoln declared Thanksgiving a national holiday. You probably knew that, but did you know that he was persuaded to do so by Sarah Josepha Hale, editor of Godey’s Lady’s Book and author of “Mary Had a Little Lamb”? She spent nearly twenty years lobbying five presidents, members of Congress, and every governor of the United States before she convinced Lincoln that it would be a good idea to help unify the country once the Civil War ended. 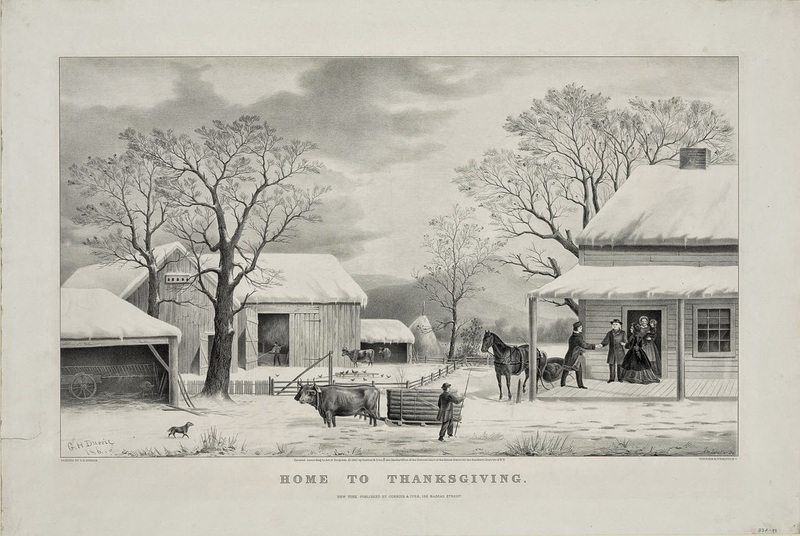 Her efforts finally resulted in success when on October 23, 1863 Lincoln declared the fourth Thursday in November as a national holiday in celebration of Thanksgiving. And here’s something else you probably didn’t know: Even though we traditionally serve candied yams, pumpkin pies, and cranberry relish with our Thanksgiving turkey, none of those foods were present at the 1621 feast. Historians believe that lobster, rabbit, chicken, fish, squash, beans, chestnuts, hickory nuts, onions, leeks, dried fruits, maple syrup, honey, radishes, cabbage, carrots, eggs, and goat cheese may have been on the menu that day. What we know for certain is that deer, fowl (but probably not turkey), fish, and corn were served. This information comes to us from the only two documented sources written about the celebration. One is a brief passage in a letter penned by Edward Winslow in December 1621. The other is from On Plymouth Plantation, written by William Bradford about twenty years after the event. So whom do we have to thank for our traditional turkey dinner on Thanksgiving? 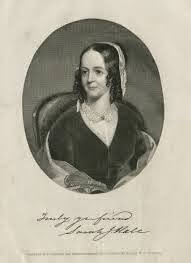 Once again, none other than Sarah Josepha Hale. She wrote numerous editorials outlining various recipes that should be used for Thanksgiving, including turkey, stuffing, cranberry sauce, sweet potatoes, mashed potatoes, and pumpkin pie. Why that menu? Perhaps they were among her favorite dishes. 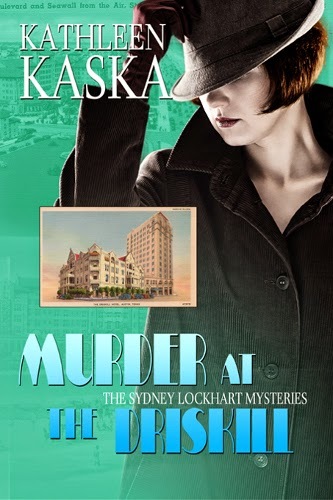 Kathleen Kaska writes the award-winning Sydney Lockhart mysteries. Her first two books Murder at the Arlington and Murder at the Luther, were selected as bonus-books for the Pulpwood Queens Book Group, the largest book group in the country. Kaska also writes the Classic Triviography Mystery Series. Her Alfred Hitchcock and the Sherlock Holmes trivia books were finalists for the 2013 EPIC award in nonfiction. Her nonfiction book, The Man Who Saved the Whooping Crane: The Robert Porter Allen Story was published in 2012. Learn more about Kathleen and her books at her website and blog. Welcome to Day Two of my blog tour “Travels to Austin: A Trip Back in Time” where I write about famous, infamous, and legendary locales in Texas’ state capital. 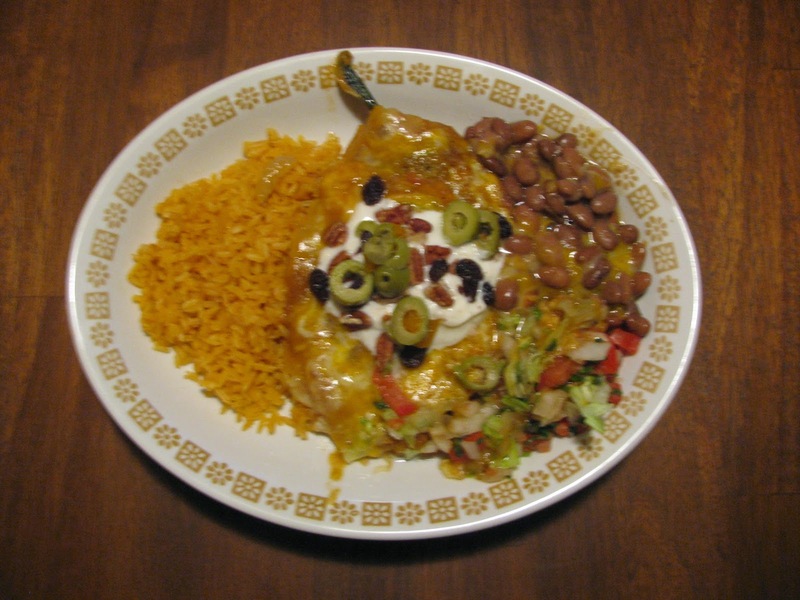 I’m celebrating the upcoming release of my fourth Sydney Lockhart mystery, Murder at the Driskill (Austin, Texas) by sharing one of my favorite recipes--Chile Rellenos, a dish I discovered at one of the city’s most famous Mexican restaurants. Getting me there the first time wasn’t easy. Read on. Sausage, kolaches, sauerkraut, and veggies from my family’s garden are what nurtured me in the small Czech town of West, Texas. When I moved to Austin in 1977 to attend the university, some friends invited me out for Mexican food. Till then, the only Mexican food I’d tasted came frozen in an aluminum tray: “I’ll go, but I really don’t like the stuff.” Boy, was I in for a surprise. 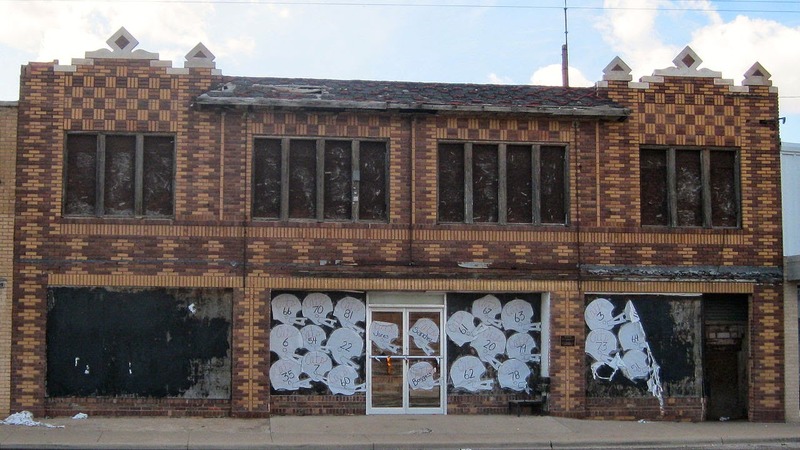 A white stucco building on East First housed Matt’s El Rancho. Matt Martinez and his wife opened the restaurant in 1952, and it soon earned Mr. Martinez the title, “King of Mexican Food.” That first visit taught me why. While my friends dug into chips and salsa, I perused the menu with the skepticism of a food snob. My plan was to order a salad and hope for the best. But aromas wafting from the kitchen were too enticing, so I ordered their signature dish, Chile Rellenos. With platter before me, I regretted not sticking to my salad order. Under a slather of sour cream topped with the most ungodly food combo—chopped pecans, green olives, and raisins—was a deep-fried thing called a poblano. And with it was stuffed with cheese. I mustered my courage and took a bite. The melding of those odd flavors exploded in my mouth. Before I knew it, I’d scraped my plate clean. That was also the night I had my first “real” margarita. Back the next week and numerous times thereafter, Chile Rellenos is still my favorite, although I’ve tasted other dishes. Seems I’m not the only one who got hooked. The story goes that LBJ often called in to-go orders, which were picked up and flown to the White House. In Murder at the Driskill, protagonist Sydney Lockhart’s cousin, Ruth Echland, goes on a date to El Rancho. If you’ve read my other Sydney mysteries, you might expect that Ruth loved the food and drank the margaritas mightily. And that she later insisted on Sydney stocking her apartment with tequila and limes, instead of gin and olives. Grill chile peppers on both sides until the skin turns black and starts to blister. This can be done on the stovetop if you have a grill pan or in the oven. If you choose the oven, turn the setting to broil and set the rack about six inches from the heat. Place peppers on the baking sheets lined with aluminum foil. It should take about ten minutes to char peppers on both sides. When peppers are cool to the touch, rise them in cold water and peel off the blacken skin. Cut a slit along the side of each pepper and remove the seeds. Pat each one dry with a paper towel. Mix the pepperjack cheese, onions, jalapeno, and cream cheese. Stuff each pepper with a quarter of the mixture. Beat the egg whites with an electric beater until they form stiff peaks. Whisk the egg yolks in a separate bowl. Fold the egg whites into the egg yolk mixture. Spread flour into a shallow dish. Heat the oil in a medium skillet. Dredge each pepper in the flour and shake off excess. Dip the peppers into the egg mixture. Gentle lower each into the hot oil. Fry until golden brown. About five minutes. To serve, top each pepper with a tablespoon of sour cream. Sprinkle with chopped green olives, pecans, and raisins. I like to serve the dish with a side of beans and rice and sliced avocado. If you’ve ever been to Austin, tell me what you liked best about the city whose promo campaign is “Keep Austin Weird.” At the end of the tour, I’ll give away a signed copy of the book. To be eligible, leave a comment on each blog. Yesterday Condo Douglas kicked off my blog tour at Conda’sCreatIve Center. On Friday you can find me at Cyndi Pauwell’s blog. You’d think that newspaper reporter Sydney Lockhart, comfortable at home in Austin, Texas, could stay away from hotels and murders therein. But when she and her detective boyfriend, Ralph Dixon, hang out a shingle for their new detective agency, they immediately land a high-profile case, which sends them to the swanky Driskill Hotel. Businessman Stringer Maynard has invited them to a party to meet his partner/brother-in-law, Leland Tatum, who’s about to announce his candidacy for governor. Maynard needs their help because Tatum is hanging out with the wrong crowd and jeopardizing his chances for winning the election. Before Sydney can finish her first martini, a gunshot sounds and Leland Tatum is found murdered in a suite down the hall. Keep the kids busy making table place cards while you’re cooking Thanksgiving dinner. This craft is easy enough for even preschoolers. 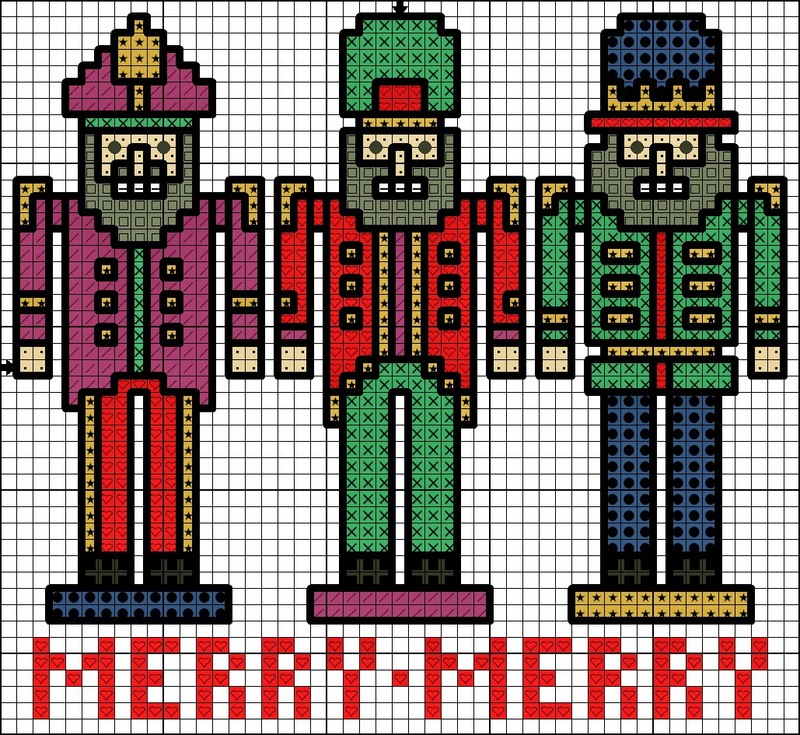 As a matter of fact, it’s a preschool oldie but goodie craft project with a bit of a twist. Draw a line across the long end of the copy paper 1” from bottom edge. Place hand in center of copy paper with wrist along pencil line. Trace hand. With marker or dark crayon, write a name across the palm. Color the turkey. Your kids will know exactly how, but for those of you who don’t remember your preschool days, the palm of the hand is the turkey’s body, the thumb is the neck and head, and the four fingers are turkey feathers. Add a yellow triangle for the beak and a red inverted heart for the wattle. Glue a wiggle eye to the head or draw an eye. Cut out along pencil lines. Fold the short ends of the 1” strip to the back of the turkey. Tape the ends together, overlap 1”. Linda O. Johnston, a former lawyer who is now a full-time writer, has published 38 romance and mystery novels, including the Kendra Ballantyne Pet-Sitter Mysteries and Pet Rescue Mysteries as well as stories for Harlequin Romantic Suspense and paranormal romance for Harlequin Nocturne. Her latest cozy mystery series, the Superstition Mysteries debuted in October. Learn more about Linda and her books at her website and blog. My fingers are crossed that you enjoy this blog post. Why? Because I write the Superstition Mysteries! 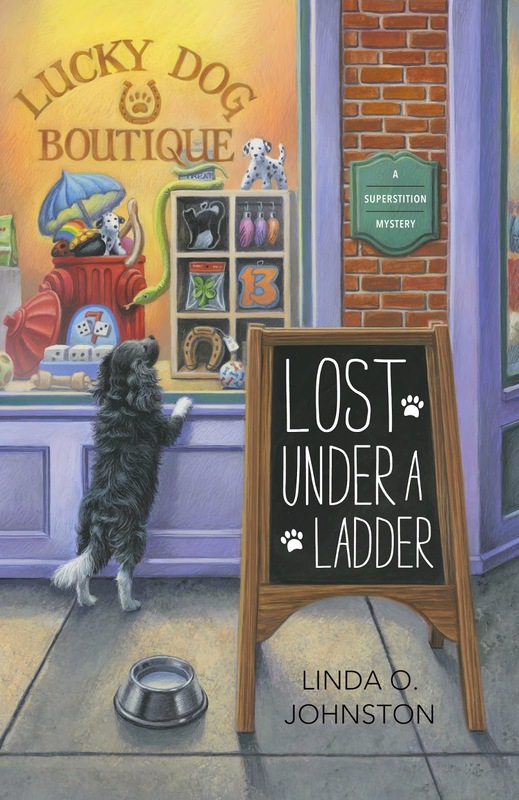 My first Superstition Mystery is Lost Under a Ladder, an October 2014 release. In it, protagonist Rory Chasen is a superstition agnostic. She isn't sure she wants to believe in them, but she needs closure after the loss of her fiancé, who died after walking under a ladder. Rory therefore goes to Destiny, California, which is all about superstitions. She brings her black and white dog Pluckie along... and Pluckie almost immediately senses an ill woman at the back of the Lucky Dog Boutique and saves her life. The woman, Martha, knows she'll be fine, since she's sure that black and white dogs are lucky! Soon, Martha asks Rory to stay and run the Lucky Dog for her while she gets better. And when Martha becomes a murder suspect, Rory has to help her--of course. Meanwhile, Rory the skeptic is surrounded by sidewalks with cracks that the tourists must avoid while picking up lucky heads-up pennies. She stays at the Rainbow B&B and visits stores and restaurants like the Broken Mirror Bookstore, the Heads-Up Penny Gift Shop, the Apple-A-Day Cafe, and the Shamrock Steakhouse as well as the Break-A-Leg Theater. Yep, the town is full of superstitions. And I've had a whole lot of fun researching them. Some of the research I've done involves superstitions of writers--of course, since I'm a writer. Am I superstitious? Well, I've become a lot more aware of superstitions since I started this series. I've always knocked on wood a bit as well as crossed my fingers. To me, though, 13 has always seemed a lucky number despite the taint on it. What are some superstitions that involve writing? Well, some writers will not end a story on Chapter 13. Others--or sometimes the same writers--cannot have 13 pages in a chapter. Still others must end each chapter on an odd --or even--page number, whichever works for them. Some writers must write something every day, even if it's just one word. Others have a special pen that they must use to sign all snail mail letters and contracts or whatever. Then there's the superstition that they can only use one pencil for writing or editing per manuscript. Sometimes they'll break that pencil when they're done with that particular manuscript. Some writers must sit down at their desks at the same time every day. Or drink the same kind of coffee from the same cup. Or wear a particular piece of clothing--a jacket, slippers, or whatever--all the time while writing. Some must have a cat around, or several. Me? I've got my two dogs. Are they lucky? Yes, I think so. They're also distracting since they have me trained to get up a lot to take them outside--and feed them treats. But they're there for me and inspire me, so, yes, they're lucky for me. What happens if superstitious writers fail to follow their superstitions? They don't want to find out! Perhaps their writing will be terrible, and/or will be buried in a slush pile and fail to attract an agent or sell to a publisher--and if it is published, readers will hate it. How do some superstitious writers choose characters' names? One superstition is that they'd better not have the same initials as someone the writer knows or that person will be doomed to bad luck. There are writers who refuse to eat anything sweet, and may choose to eat something totally sour when they're writing about the villains in their stories, or those villains might wind up as likeable characters. And if some writers are traveling, they might not get a whole lot done because they believe their best work can only be achieved at their usual work station and computer. Can they transfer the luck by memory stick to a laptop or tablet? That depends on their superstition! So... if you're a writer or know one, please share any writing superstitions with me. It'll surely bring you good luck. I'm knocking on wood now to ensure that's true. Lynn Chandler Willis is the first woman in ten years to win the St. Martin's Press/PWA Best 1st PI Novel competition. She lives in North Carolina with Sam the cocker spaniel. Learn more about her and her books at her website. When I was researching settings for Wink of an Eye, I knew what I wanted. I knew I wanted heat, desert, dirt, and rugged mountains. Throw a couple cacti in for good measure. I probably could have settled for any small town in New Mexico, Utah, or Arizona, but I was drawn to Texas. Each state in these great United States of America has its own personality, its own quirks and charms. Most states are known for one thing or another that is unique to that particular state. And often, a state's residents, especially the native-born, share certain characteristics. In Texas, one of those characteristics is Texas pride. Every Texan I've ever met or talked to loved their state. “Texas” isn't just a physical place—it's a way of life. Whether it's the ultra urban cities like Dallas and Houston, or the smaller towns, like Wink, Texans are proud to call the Lone Star state home. I started my search looking at the smaller towns. Google became my friend. I wanted a town with a population under 2,000, a few mom-and-pop businesses, and at least one somewhat odd-ball fact. And then I found Wink, Texas. Home of the Roy Orbison museum (call for an appointment to visit), sidewalks, and two giant sinkholes. My main character, Private Investigator Michael “Gypsy” Moran, was coming home. To learn more about the town Gypsy was running home to, I continued my research and discovered the little town of Wink, Texas has a weekly newspaper—and it was online! I immediately subscribed and with each new edition of the small town paper, I fell more in love with the tiny town. 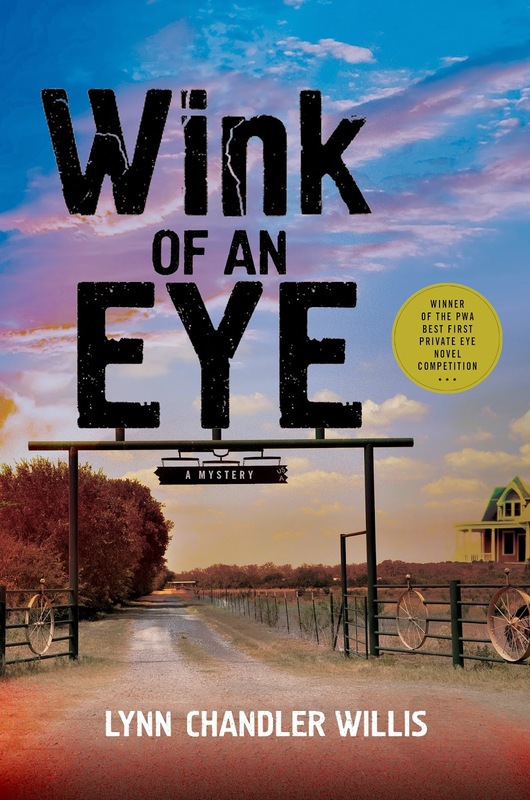 The people of Wink, Texas weren't the oil barons of Dallas or the country club golf pros of Houston; they were down to earth, working class people. They were the people I wanted Gypsy Moran to call family. Although fiction takes the reader to a make-believe world, the characters need to be real enough for the reader to be able to relate to them in some manner. In Wink of an Eye, the main characters are everyday people. They get up and go to work or school, they eat dinner together at a cramped kitchen table, and they're more likely to drink a cold beer on their back deck than a dry martini in a penthouse. They're the people of Wink, Texas. A place Gypsy Moran is proud to call home. When twelve-year-old Tatum McCallen finds his father, a deputy sheriff, hanging from a tree in their west Texas backyard, he sets out to restore his dad's honor and prove he didn't kill himself. He and his disabled grandfather hire reluctant Private Investigator Gypsy Moran, who has his own set of problems. Like a double-cross that sent him fleeing Vegas in the middle of the night. Gypsy agrees to help the kid and his grandfather Burke because he feels sorry for them. Burke, a former deputy sheriff now confined to a wheelchair, is all Tatum has left. When Tatum shows Gypsy a private file his dad had been keeping, Gypsy knows the kid's father was on to something when he died. Eight missing girls, a cowardly sheriff, and undocumented workers are all connected to the K-Bar Ranch. Gypsy is quite familiar with the K-Bar Ranch. Before running off to Vegas, he spent his summers as a teenager working for ranch owner Carroll Kinley while romancing Kinley's beautiful daughter Claire. But Claire, now married to a state senator, is managing the ranch now and is more involved with the case Tatum's father was secretly investigating than Gypsy wants to admit. Aided by adolescent Tatum and reporter Sophia Ortez, Gypsy begins pulling the pieces of the puzzle together, but it could end up costing him his life. Or worse—Tatum's life. Every once in awhile we need to shake things up a bit here at Killer Crafts & Crafty Killers. After some brainstorming we came up with a few ideas we plan to introduce to the blog every so often. One of these new features is This Day in History. Why? Because it’s fun to learn what happened on a particular date in years gone by (and sometimes we just can’t think of anything to blog about!) Today we kick off This Day in History with some of the notable events that have taken place on November 19th. Core, trim, and chop apples into bite-sized pieces, leaving skins on. Melt 5 tablespoons of butter in large skillet. Add nuts, lemon zest, oats, brown sugar, cinnamon and salt. Toss to coat. Cook, stirring frequently, until golden brown. Remove from pan. Melt remaining butter in pan. Add apples and blueberries. Cook, stirring frequently, until apples are soft but not mushy. Mix topping back in. Stir together. Serve warm by itself or over vanilla ice cream. Click on images to enlarge chart and Color Key. In the musical South Pacific Lt. Joe Cable is a Philadelphia blueblood who has fallen in love with a Polynesian girl. As much as he loves Liat, he knows he could never marry her. He laments about bigotry in “You Have to Be Carefully Taught,” a song about how children learn from a very early age to hate and fear people who are different from them. Hatred is not born in us; we’re taught it, often from a very early age. It’s passed along from generation to generation until we have no idea why we hate members of another race, religion, ethnic group, political party, sexual persuasion, or country. We just do. And taken to extremes, this hatred often becomes deadly. Hatred is what creates bullies, violence, wars, and terrorists. The only way to combat hatred is to teach children not to hate. This can be a daunting task, but it’s one we all need to undertake if we’re ever going to find a way for people to get along with each other, no matter their differences. To that end I wrote The Magic Paintbrush. 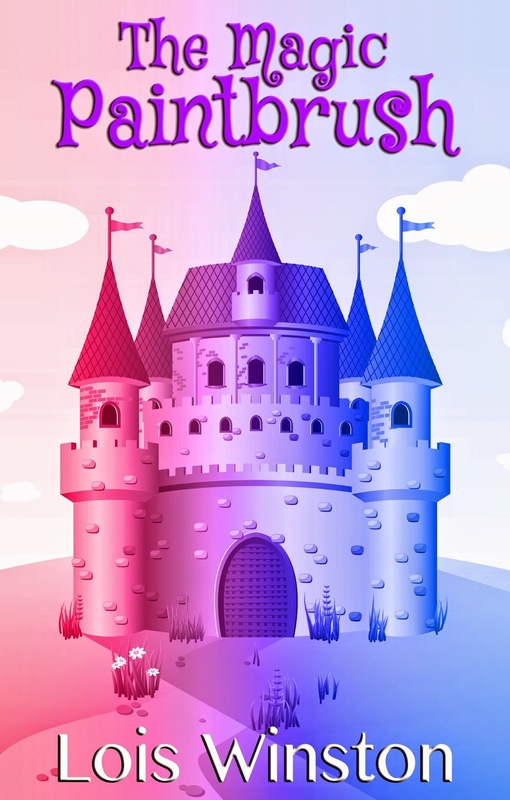 Without being preachy, The Magic Paintbrush addresses the issue of differences, in this case, a kingdom that is all pink at war with a kingdom that is all blue for longer than anyone can remember—so long that no one even knows what started the feud. It takes two children from another land to point out to the rulers of both kingdoms how we're all really the same inside and the benefits to getting along. With the holidays fast approaching The Magic Paintbrush would be a perfect gift for youngsters on your gift list. And maybe the adults will learn something, too. The book is suitable for readers eight years old and up to read on their own and can be read to younger children. Kate Dyer-Seeley writes the Pacific Northwest Mystery Series for Kensington Publishing. 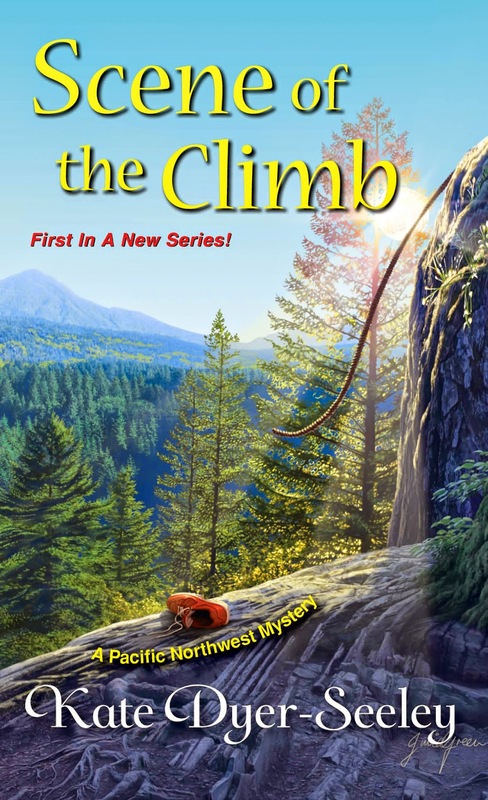 The first book in the series, Scene of the Climb, features the rugged landscapes of the Columbia River Gorge. Kate’s work has appeared in a variety of regional and international publications. Learn more about her and her writing at her website. I’ve been a fan of mysteries for almost as long as I’ve been reading. I started with Nancy Drew and Trixie Belden and worked my way through all of Agatha Christie’s books one year in high school. Mysteries are escapism at its best, taking readers on a quest to figure out whodunit, with plenty of page-turning twists and a dash of romance. My favorite thing about reading the genre is that mysteries also serve as travelogues, offering a glimpse into a quaint village, or a charming small town. I’ve traveled to the English countryside, a dreary castle in Scotland, a coffeehouse in New York City, eclectic neighborhoods in San Francisco, and so many other corners of the globe while reading mysteries. 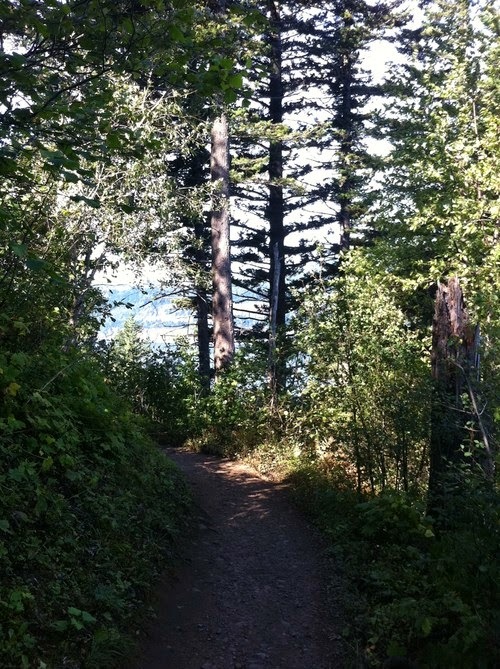 When I decided I wanted to try my hand at writing a mystery, I knew I had to write about the Pacific Northwest. Like the famous writing adage I had to write what I knew. And I know the Pacific Northwest. I’ve spent my entire life (minus college and travels) in ruggedly beautiful Portland, Oregon. It’s a city that feels like a small town with artisan coffee shops, pubs on every corner, and the outdoors within minutes of downtown. On the weekends my family and I like to lace up our boots, fill our Camelbacks, and head out to our favorite trails. 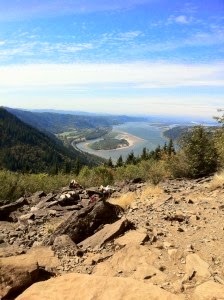 One weekend we opted to hike Angel’s Rest in the Columbia River Gorge. It’s one of my favorite hikes. It’s a relatively easy climb to the 2,000-foot summit, and the payoff at the top is worth any amount of sweat. The rocky summit boasts staggeringly beautiful views of the Columbia River and Washington hillsides. It’s also dangerous, and the setting for my new mystery Scene of the Climb. While we were trekking through switchbacks and working our way to the summit, a thought flashed through my head: What if someone fell from the top of Angel’s Rest, and what if they had help? The perfect setting for a mystery had appeared. Now I just needed a protagonist. That came when we made it back to the trailhead and I spotted a young woman hiking with a group of burly men. She was the only female, and the only one wearing pink hiking boots. Perfection! From there the story came together. The young woman in the pink hiking boots became Meg Reed, twenty-three, fresh out of journalism school, and couch-surfing in Portland, Oregon. When she has a chance encounter with the editor of Northwest Extreme magazine, she bills herself as an intrepid adventurer in order to land a gig writing for the outdoor publication. The only problem is that Meg’s idea of sport is climbing onto the couch without spilling her latte. The magazine sends her to Angel’s Rest to cover a reality TV adventure race filming in town. She claws her way to the top of a cliff only to witness a body falling off the summit. Meg is suddenly out of her element and mixed up in a murder investigation. The Pacific Northwest becomes its own character in the book as Meg treks to popular tourist spots like Multnomah Falls, and more challenging climbs deeper in the woods. She and her friends meet at their favorite local pubs and puzzle over the clues with pints of Oregon’s famed microbrews. Hopefully readers will get a glimpse of the Pacific Northwest’s wild untamed spaces, and a taste of its eclectic culture as Meg fumbles her way through her first assignment and a murder. Donnell Ann Bell is an award-winning author of three romantic suspense novels, all of which have been e-book bestsellers. Buried Agendas is her fourth published novel. Currently she is working on her first suspense series for Bell Bridge Books. Donnell and her husband live in Colorado. Learn more about Donnell and her books at her website. Stress – who needs it? I read an interesting article once that said some people thrive on stress. Hard to believe, but when you think about it, that explains why people go into law enforcement, become hot shot firefighters, become heart surgeons, or high rise window washers. They need challenges, the adrenaline rush that comes from their jobs, and these individuals deliberately choose to put stress in their lives. These are the types of characters we writers love to create because they’re like a sleeper sofa with a built-in bed. Writing characters with dangerous occupations comes equipped with conflict. That’s the reason I like suspense. I’ve written about cops, defense lawyers, and a woman in jeopardy being stalked by an ex-convict. I infinitely prefer giving my characters stress, while keeping me out of it. When I think about Lois Winston and her Anastasia Pollack series, Lois chooses a character who’s doing her best to avoid stress. Anastasia is a craft editor who craves the mundane. But with two boys, a narcissistic always-wedding mother, and an even crazier communist mother- in-law, stress is regularly heaped on Anastasia. Add a body or two in Lois’s stories, and she has the complete hysterical stress-filled package. 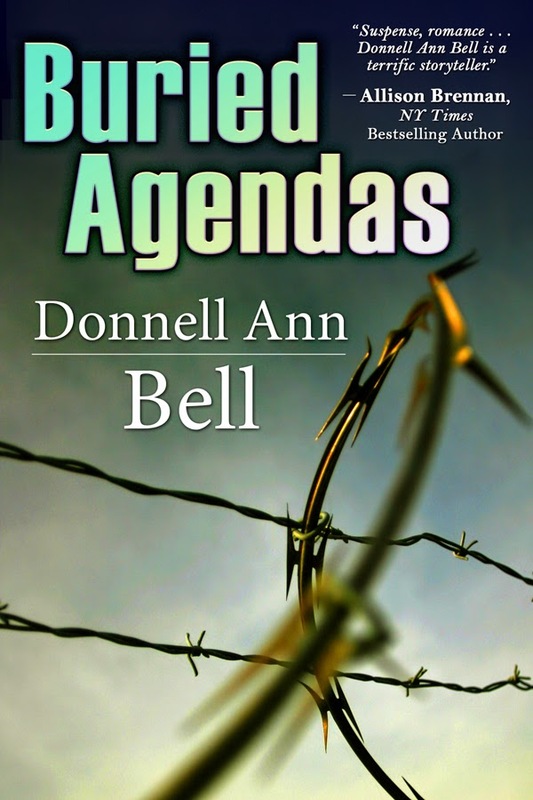 In BURIED AGENDAS, my newest release from Bell Bridge Books, my characters are under stress. I send my investigative reporter into a place where her credentials are useless. She has to enter Jordan Industries, a chemical processing plant, using only her wits, and everything about what she is doing is not only risky but illegal. I’m grateful there are a lot of different personalities in this world. It keeps us writers in business. As for stress, I prefer to avoid it. How about you? Are you an adrenaline junky? Do you crave excitement or put yourself in stressful situations? Or are you more like me and believe stress is for the other guy? For commenters, let’s do a drawing. Recently I saw the cutest stress reliever ever, and I’d like to include it in my giveaway. Today I’ll send one commenter a copy of Buried Agendas and a Dammit Doll, so be sure to include your e-mail address. 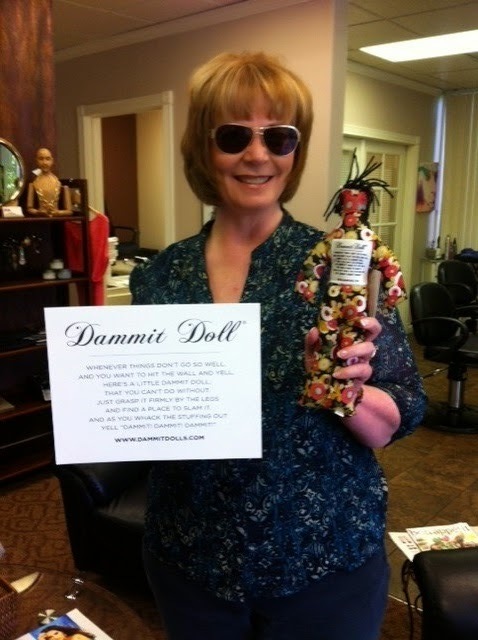 here’s a little dammit doll that you can’t do without. Here’s to climbing mountains or lying on a beach, whichever you prefer. Diana Reid is an investigative reporter skilled at uncovering other people’s secrets. It’s her own that she works to keep buried. Eight years earlier, she promised to leave her fiancé and hometown of Diamond, Texas forever. That pledge vanishes when she receives a letter stating people are going to die, implicating her hometown’s largest employer, and making a veiled threat against her mother. With no other choice, Diana will return to Diamond, albeit in disguise, to discover the anonymous author. Brad Jordan moved on with his life after Diana walked out on him. Needless to say, she’s an unwelcome topic. Just as he rebuilt his life, the newly elected mayor of Diamond, and newly engaged to be married, he plans to rebuild his struggling hometown. Those plans are threatened when an El Paso physician notifies Brad that she believes his family’s company, Jordan Industries, is conducting illegal practices and sacrificing the public’s health. When the doctor suggests bringing in Diana to uncover the wrongdoing, Brad is opposed to the idea. Still, when she appears despite his wishes, he is forced to accept that a woman he vowed to forget may be his only option to get to the truth.